Armenian President Serzh Sargsyan came to Belgium on 5 March 2012 for a working visit during which he negotiated the Association Agreement (AA) and the Deep and Comprehensive Free Trade Area (DCFTA) with the European Union, as well as the visa facilitation agreement. On 5 March 2012, he met the representatives of NGOs (including EuFoA) and the Armenian community in Belgium. Armenian media were present and widely covered the event. Please click here to watch the report of Armenia TV from the event. Below we provide you with a summary of the report. On 5 March 2012, he met the representatives of the Armenian community in Belgium, which was created at the beginning of the 20th century in the early 1920s, and today counts about 20 000 Armenians. The President stated that Belgian Armenians, and the Diaspora in general, are a bridge between Armenia and Europe. Belgian Armenians aim at maintaining good relations with the country where they live in, being active and well-integrated but they do not overlook their fatherland. After the President’s speech, the audience had the opportunity to ask questions about Armenian-Turkish relations, Nagorno-Karabakh conflict settlement among others. Not surprisingly, the upcoming elections were at the heart of the discussions. 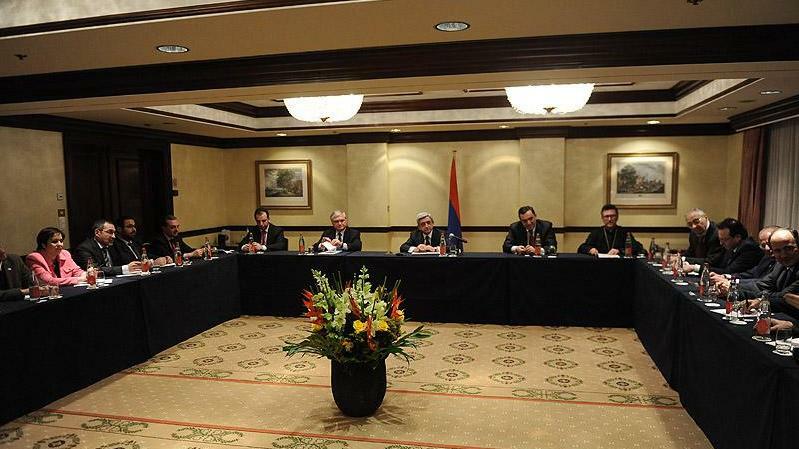 If the country manages to hold free and fair elections, this will restore Armenia’s image.